Commuters of three Indian cities, Delhi, Mumbai and Bangalore have a reason to rejoice. With a system called Traffline which is slowly becoming mainstream one can know the traffic congestion status in these cities. 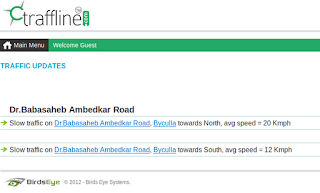 The site floated by Bird Eye Systems promises up-to-date information about traffic situation in city roads. This becomes possible as the information is sought live from GPS devices fitted on to public transport vehicles. The company will be launching Android and iPhone apps by October. 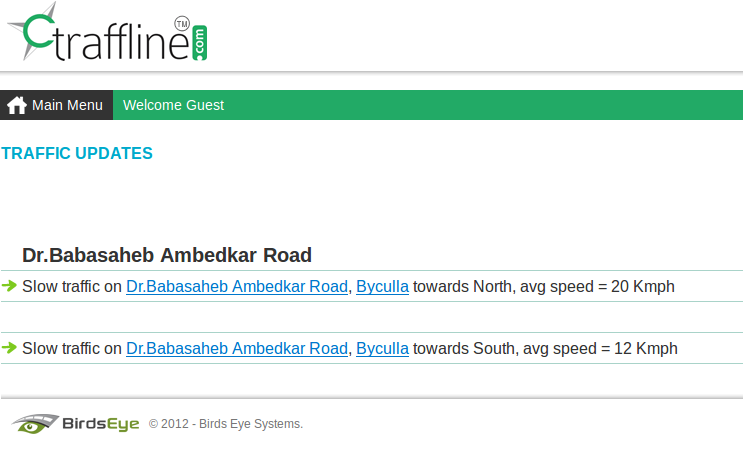 Currently one has to visit their website http://www.traffline.com (mobile version as http://m.traffline.com)to get traffic information displayed on map. Another way to get information is registering for SMS Alerts (Currently available only for Loop Mobile subscribers in Mumbai). Facility to seek driving directions and searching traffic updates by road/area is also available. In days to come, the site plans to include accident and event information by sourcing it from traffic police control room. Founders claim that information is updated within ten minutes of receiving it, thus making it real-time. If no updated information is available for a certain stretch, they refrain from publishing that information. Hence some roads may not have traffic lines on the map. Let's hope more Indian cities get covered in coming months and people can reach offices and homes early!